For Mark Allen, this has been a week like no other in his seven-year career. The world number 14 from Northern Ireland finds himself in his sixth career semi-final today, facing world number 22 Ricky Walden for a place in the UK Championship final to face tournament favourite Judd Trump. But his route to get here hasn’t exactly been plain sailing. Following his first round 6-3 defeat of Adrian Gunnell on Monday, Allen took the opportunity in his post-game conference to call for World Snooker chairman Barry Hearn to resign following his decision to reduce the early rounds to best-of-11 frames down from best-of-17. It was a remark that has followed him throughout this week, as Hearn responded by labelling the Antrim potter a “silly little boy”, and one he may well seek legal action against. And just yesterday, Allen was hit by the news that his manager Paul Mount had been rushed to hospital with heart problems, just a few hours after arriving at York’s Barbican Centre to see his player in action. For a player who admitted to suffering from depression as recently as April, the off-table distractions can’t be ideal preparation. In theory, at least. In practice, as impressive wins over world number eight Ali Carter and Marco Fu have shown, Allen, 3/1 to lift his first major title, seems to be using the controversy to his advantage. 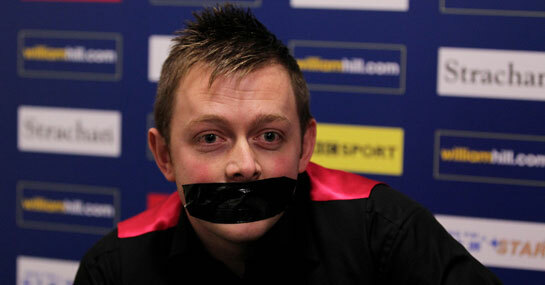 Indeed, he turned up to a recent press conference with a mock ‘gag’ taped over his mouth in response to Hearn’s reaction, and his bullish defiance seems to have spread to the table, as he overturned a 5-4 deficit to claim the vital final two frames over Fu in a hard-fought victory on Thursday. Facing a buoyant Ricky Walden today (5/4 to win) who saw off former World Champion Shaun Murphy 6-3 and who plays in his first-ever semi-final, Allen will need to show the same steely traits that he’s shown this week, particularly given his uninspiring previous record in ranking semi-finals: played five, lost five. Nonetheless, at 8/13 to win the match, he should have enough today to break his duck and make it past his inexperienced opponent, setting up a tasty Sunday final with Trump. The irony is, of course, that should he do so, his tête-a-tête with the boss will bring just the sort of media attention to the showdown that Hearn craves, in a sport not exactly renowned for its heated rivalries.